Your Last Chance to Attend the Brooklyn Reality Tour? FlyerTalk member dhammer53 has hosted the Brooklyn Reality Tour for 17 consecutive years since he originally created this now-legendary FlyerTalk event and is preparing to host the 19th Annual Brooklyn Reality Tour. Saturday June 2, 2018, which dhammer53 has been proclaiming in no uncertain terms that this year will be the its last year for what is also known as the BRT — or is it?!? It took everything I had not to overtake the microphone on the bus away from FlyerTalk member dhammer53, who is also known as Dan Hammer. Photograph ©2011 by Brian Cohen. To be fair, this song has been sung before, as dhammer53 declared back in 2010 that that year will be the last year for the Brooklyn Reality Tour — but he sounds like he really means it this year. During the Brooklyn Reality Tour, you eat authentic Brooklyn cuisine. And you eat. And eat. And eat. Photograph ©2011 by Brian Cohen. I hope that my fellow native Brooklynite is bluffing. The tour is a great way to intimately get to see and know my original home. I attended the Brooklyn Reality Tour in 2011 with Randy Petersen — it was the first time for both of us — and the tour stopped within a half of a block from one of the homes in which I grew up as a boy. I also saw the high school which I attended before they demolished the building and moved the high school to a new location. Randy Petersen — who is the founder of BoardingArea and FlyerTalk — is in Coney Island with the world-famous Parachute Jump in the background. Photograph ©2011 by Brian Cohen. A lot has changed in Brooklyn since I left. What was once considered basically an outer borough of the city of New York has become one of the hottest destinations in the world — to the point that no matter where I travel in the world, I am bound to find someone who is wearing a Brooklyn shirt or baseball cap. FlyerTalk members board the bus at the usual location in Manhattan for pushback of the Brooklyn Reality Tour. Photograph ©2011 by Brian Cohen. Although every year is a little bit different, the tour winds through some of the neighborhoods of Brooklyn — from Flatlands where dhammer53 grew up as a boy to Coney Island to Brooklyn Heights — and with different landmarks and points of interest. 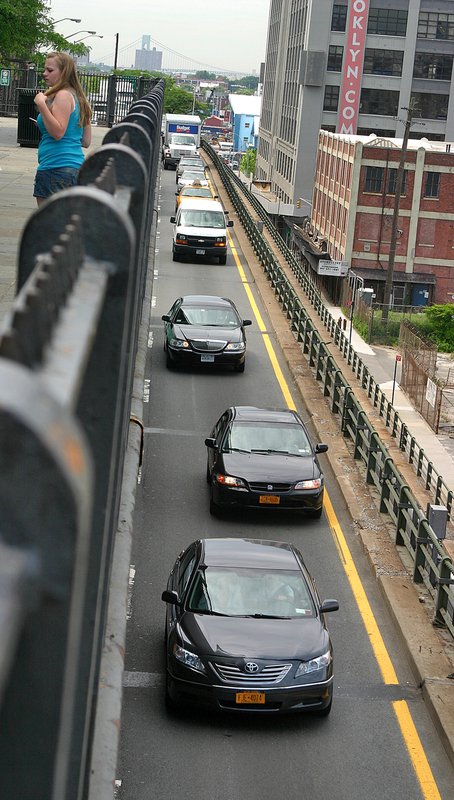 The Brooklyn-Queens Expressway under the Brooklyn Promenade is clogged with the usual traffic that basically has not changed in decades. Photograph ©2011 by Brian Cohen. The name of the Brooklyn Reality Tour was coined by the late FlyerTalk member magic111, — who was a friend of mine — from an episode of the television show Seinfeld, of which the character Cosmo Kramer conducted what he called The Peterman Reality Tour. Brooklyn Heights. Photograph ©2011 by Brian Cohen. The cost to attend the Brooklyn Reality Tour for 2018 is $75.00. The departure time is at 11:00 in the morning at 234 East 46 Street between Second Avenue and Third Avenue on the east side of Manhattan. The theme of the Brooklyn Reality Tour this year is 1968 meets 2018. Two seats remain available for this year — and keep in mind that the Brooklyn Reality Tour has sold out every year since it was founded by dhammer53. Could this be some devilishly fiendish plot to have the Brooklyn Reality Tour mentioned here at The Gate? If so, nice try, dhammer53, but it will never work, as the Brooklyn Reality Tour will never be mentioned or posted here at The Gate — just like it has never been mentioned here, here, or here. All photographs ©2011 by Brian Cohen.